Jeff Bezos, the Amazon founder and CEO, now has a net worth of $141.9 billion, which is already $43.6 billion more than he was worth in half year. As wealthiest person in the world, Jeff Bezos is richer than he has ever been before. Since June 1, the tech CEO’s net worth has grown over $5 billion and now totals $141.9 billion, according to the Forbes World’s Billionaires list. That makes Bezos worth roughly $49 billion more than Bill Gates and about $60 billion more than Warren Buffett. Counting on the past 169 days this year, Bezos earns $ 2,580 million per day, $ 1.075 million per hour, $ 2, 986 per second. What a huge amount to normal people! 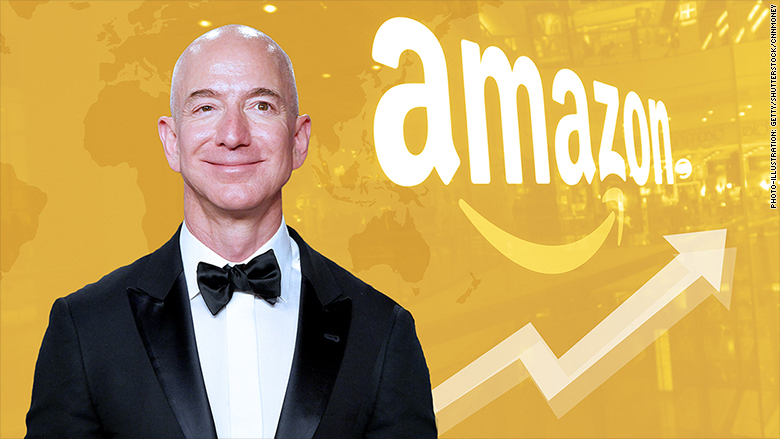 Bezos is worth $43.6 billion this year, benefit from the rise in Amazon’s stock price, which is now about 78.9 million shares, that’s the major source of his personal wealth. Amazon shares closed at $1,723.79 on Monday, up 47.4 percent from $1169.47 at the close of the last trading day of last year, while Bezos’s net worth rose 44.4 percent. Bezos learned that internet usage was growing at 2,300 percent per year. It seemed like proof that his fantasy of an online book store could become a reality. ‘I’d never seen or heard of anything that grew that fast,’ he told Princeton University, his alma mater, during a 2010 commencement address.